The Rolling of the Peas is an IHSA tradition that dates back to the 1940's and potentially earlier. 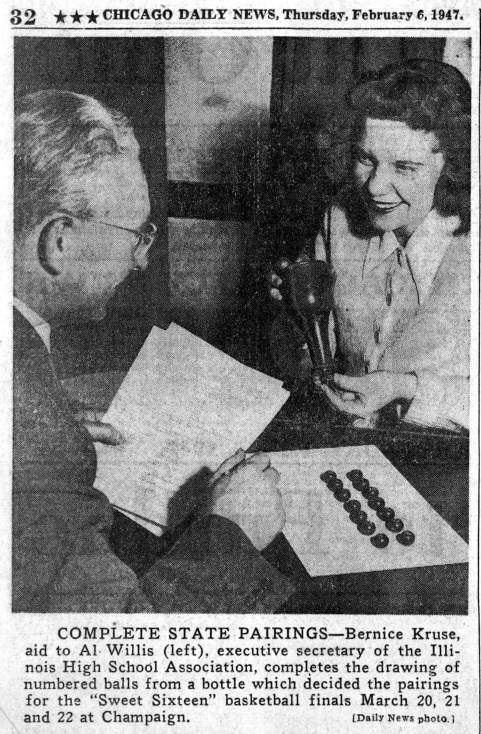 The Chicago Daily News story below from 1947 was the earliest reference to the Rolling of the Peas until 2015, when the IHSA discovered a reference to it in a 1940 publication, also pictured below. Postseason assignments in IHSA team sports are based upon geography at the Regional, Sectional and Super-Sectional rounds. For the state finals, the peas provide a random, unbiased process to determine who will play who in the first round. The process itself is very easy. Each site is assigned a pea number and each pea contains a corresponding number on it. Peas are then drawn to determine which site winners will meet at the state finals. 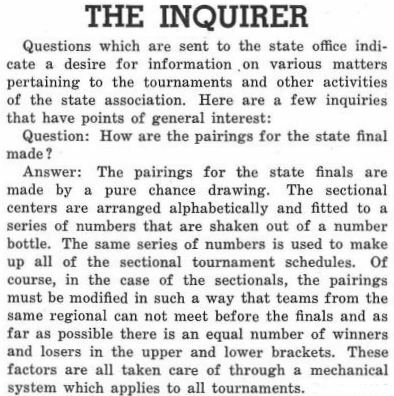 By 1975 the IHSA was regularly bringing in neutral parties (usually media members) to roll the peas, thus ensuring a witness to the sometimes controversial process of pairing the teams. Occasionally special guests have shown up to roll the peas, like the members of the Fenwick High School Water Polo team, who stopped in Bloomington to roll the peas en route to a tournament in St. Louis in 2012. The original peas and leather bottle are now on display at the IHSA Peak Performance Center at the Peoria Riverfront Museum. A modern, plastic bottle (above) rolls the official peas these days.